The new Orphan Enzymes Project site is up. Gene and protein sequences really are the basic blueprints of life. We’re now living in a time where you can get that full blueprint for a bacterium in well under an hour – and you’ll spend most of that time loading your sample into the sequencing machine and reading the output. We interpret that full blueprint by comparing it to all the individual sequences we already know. As a result, protein and gene sequences are not only blueprints, but effectively addresses or library card catalog numbers. They tie the genetic information we’re looking at right now to all the research that has gone before. Without a sequence address, we can’t connect our past knowledge with the sequence we’re staring at right now. So it’s been a real problem that we don’t have that sequence information for up to a third or so of all the enzymes we know. The Orphan Enzymes Project is an effort I’ve been leading for a few years now that aims to tackle that problem and connect modern sequencing efforts to the research community’s “back catalog” of amazing research. The new site was put together by my talented collaborator Christine Rhee, who is also working on a vision for a true community effort to resolve the orphan enzyme problem. If you asked me if my field is global, I’d snap-answer “Of course.” After all, less than half a year ago I was at a meeting in Odaiba, the newest section of the Tokyo waterfront. I hope that our hosts at the Tokyo International Exchange Center are doing well in the wake of the recent earthquake — especially since Odaiba is reclaimed land and has been subject to serious liquefaction. If this looks unfamiliar, that’s because it’s not one of the default bacterial media. It’s adapted from this paper by David Gutnick et al, where a similar medium base was used to test some six hundred compounds as potential carbon or nitrogen sources in Salmonella. Yes, I really did go back about four decades to scour a materials and methods section for a media recipe. Microbiology buffs may also want to check out the senior author on that paper. Wow. That might lead one to wonder how the chemical manufacturers of Japan are doing these days. Am I going to find myself lacking magnesium sulfate in the near future? Should I stock up? I found it particularly curious that the dibasic potassium phosphate came from the United States but the monobasic potassium phosphate is from Japan. The truth is that these are all very common laboratory chemicals, and none of them will come from just one source, so even if one country suffers an industrial downturn, researchers will be okay. But there are many less frequently used chemicals that will have a sole source. We’ve seen this in our own work, where we have quite literally purchased the last stock in the entire world of certain items – items that won’t be replaced as far as we know. It’s apparent that these “single source” compounds are especially vulnerable to problems in the supply chain. Maybe the country has a natural disaster, or the technician who purifies that compound retires. But beyond these obvious cases, the sourcing on my media components highlights how much of the research we carry out on a day-to-day basis can be stopped cold by disruptions to modern just in time supply chains. If production of monobasic potassium sulfate suddenly halts in Japan, maybe there are facilities elsewhere, but no back inventory. Do you keep a back supply of critical chemicals on site in your lab? How long can your research lab run without resupply? It may seem curious to think about protecting your lab against natural disasters halfway across the world, but someday it might just mean avoiding a whole-lab shutdown for weeks because your access to one critical chemical has dried up. I have a new addition to my list of favorite scientists. There’s clever, and then there’s having a vision for future needs. It’s the second one that’s really tricky. It’s also important, since it opens up avenues of discovery that we might otherwise never see…or at the very least, that may force us to keep revising our methods over and over again to try and keep up with the data. 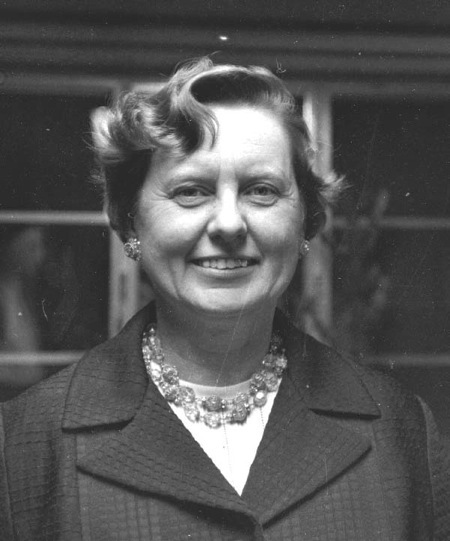 Margaret Oakley Dayhoff was responsible for one particularly elegant and yet stunningly important change in how we handle biological data, a change that required a vision for a future for bioinformatics well beyond what most of her peers imagined.